Tonight, at Central Regonal High School in Bayville, New Jerse,y Fight To Win Pro returns for the second time in 2017. 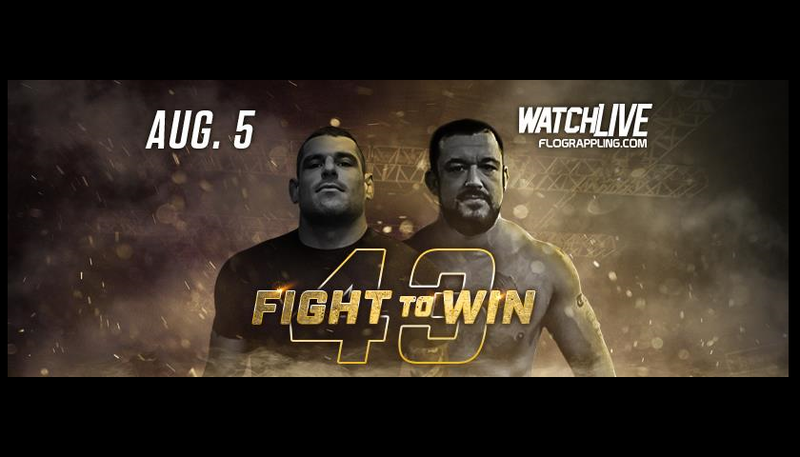 The 43rd Fight To Win Pro has a phenomenal main event featuring local hero Tom De Blass vs. current champion, Joao Assis. 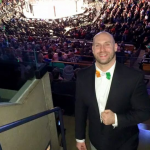 DeBlass defeated former UFC heavyweight champion Ricco Rodriguez via unanimous decision in his Fight to Win Pro debut back in April. 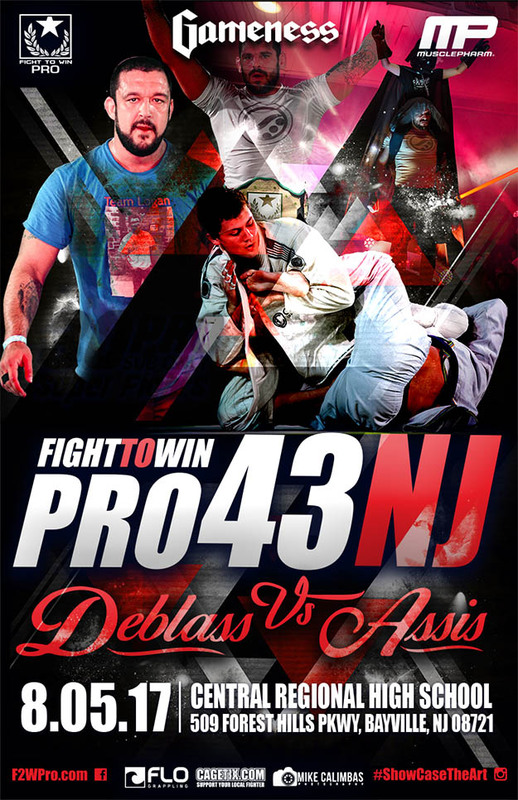 Tom Deblass (Ocean County BJJ) vs. Joao Assis (CheckMat): Joao Assis winner by decision. Kory Acchione (Madama Jiu Jitsu) vs. Tex Johnson (Unity): Tex Johnson winner by decision. Jeff Lentz (Lentz MMA) vs. William Wolk (G13): William Wolk winner by decision. Kristian Woodmansee (Atos) vs. Chris Noonan (Hive Martial Arts): Kristian Woodmansee winner by toe hold. Frankie Roberts (Silver Fox BJJ) vs. Steven Barnett (Inferno MMA): Steven Barnett winner by decision. Steve Mathis (Triton Fight Center) vs. Radji Bryson-Barrett (Team Jucao): Radji Bryson-Barrett winner by clock choke. Joseph Kutcha (Madama Jiu Jitsu) vs. Joseph Marino (Pellegrino Jiu Jitsu): Joseph Kutcha winner by wrist lock. Garret Lavaggi (Ocean County BJJ) vs. Viktoras Soutas : Garret Lavaggi winner by guillotine. Eric Johnson (Osagame BJJ) vs. Mark Fitzpatrick (Pellegrino MMA) Mark Fitzpatrick winner by decision. Marcus Johnson (Garden State BJJ) vs. Christopher Brookens (Robson Moura): Marcus Johnson winner by knee bar. Michael Oettinger (Renzo Gracie) vs. George Sullivan (Pellegrino MMA): George Sullivan winner by decision. Natalie Bryjova (Diesel Training) vs. Caitlin McManus (Savarese BJJ) Natalie Bryjova winner by knee bar. Howard Niego (Renzo Gracie) vs. Jay Isip (Pellegrino MMA): Jay Isip winner by neck crank. Nick Manela (Gracie Barra) vs. Andrew Branch (AMA FIGHT CLUB): Andrew Branch winner by decision. Urijah Suarez (Balance) vs. Matthew Holthaus (Pellegrino MMA) Matthew Holthaus winner triangle. Jason Patt Parton bcon (Martinez BJJ) vs. Ashure Elbanna (Dante Rivera BJJ): Jason Patton winner by baseball choke. Kyle Huang (Roots Athletics) vs. Tinh Tupy (Pellegrino MMA): Kyle Huang winner by decision. David Matias Gonzalez (OCBJJ) vs. Gui Mitone (MADAMA): David Matias Gonzalez winner by decision. Melissa Feinberg (Trinton Fight Center) vs. Andrea Jordan (Pellegrino MMA): Andrea Jordan winner by armbar. Amanda Leve (RABJJ) vs. Brittney Elkin (Easton BJJ): Amanda Leve winner by decision. Justin Giovine (Inferno MMA) vs. Joe Mozden (Balance) Justin Giovine winner by decision. Billy Johnson (Sub Force BJJ) vs. Ed McCay (OCBJJ): Ed McCay winner by heel hook. Nathan Ray (Advanced Martial Arts) vs. Chris Tuzene. Chris Tuzene winner by triangle. Alex Nemeth (Vitor Shaolin BJJ) vs. Sean Yadimarco (Savarese BJJ): Alex Nemeth winner by decision. Brian Demuro (SJBJJ) vs. Ryan McCarthy (Inferno MMA): Ryan McCarthy winner by decision. Jesus Malaga (MADAMA) vs. Chris Grusemeyer (Balance): Jesus Malaga winner by decision. Immanuel Chang(OCBJJ) vs. Valor Boyer(127 BJJ): Immanuel Chang winner by heel hook. Júlia Balmante (BTT) vs. Gabby Etzel (The Hive): Júlia Balmante winner by triangle armbar. Brian Rast (North Jersey MMA) vs. Savion Maranon (Covel BJJ): Savion Maranon winner by triangle armbar. Nick Colalilo (Nick Catone MMA) vs. Levi Foote (The Hive): Levi Foote winner by armbar.